Congratulations to Terri, the Women’s Captain and her committee on a well-run Women’s Open Day on 5 June 2018. There were 93 women from a number of clubs as far away as Caloundra and Tin Can Bay. The shot-gun start in perfect weather resulted in an excellent day of golf followed by a relaxed lunch together. Thank you to all those who worked so hard before, during and after the competition to make the day a success. Our club is noted for the support it receives from its members and this was evident on the day which started with a scrumptious morning tea and finished with a beautifully presented lunch. Our sponsor, Jacquie Kiel from Cooroy LiveLife Pharmacy presented Adina Watches to the Nett winners: Diane Chard (Cooroy), Maria Taurer (Cooroy) and Gross Winners were Jean Brkic (Mt Coolum), Eve Hunt (Cooroy), and Lynne Dawson (Cooroy). Irene Lally’s trophies for Seniors were presented to Maria Taurer (Cooroy) and Karen Allen (Gympie). The support of our sponsors is greatly appreciated. Photo: Jacquie Kiel with winners of Adina watches. 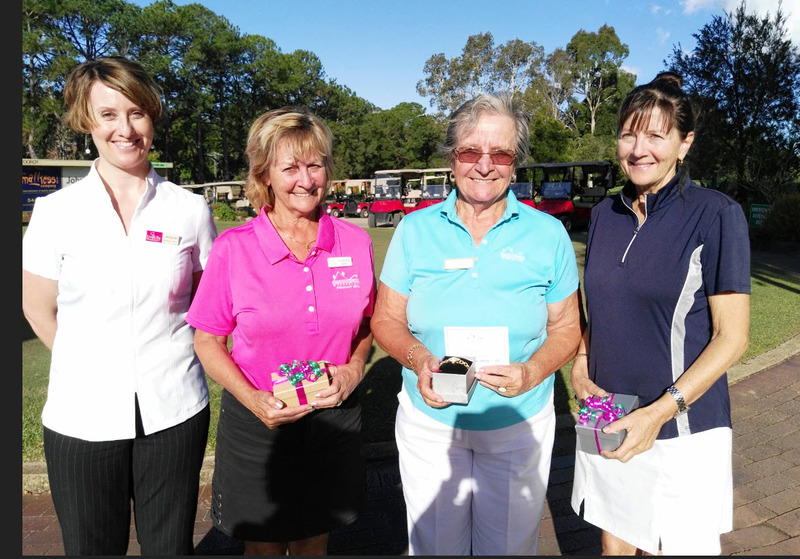 Left to right – Jacquie Kiel, Rosemary Caffyn (Div 3), Maria Taurer (Div 2), Diane Chard (Div 1).